Rehlat – one of the fastest growing travel websites in the Middle East, offers wide range of cheap flights to Kuwait city including one-way or round trip as well as provides daily schedules & information on non-stop flights to Kuwait. Choose from the best selection of low cost flights to Kuwait from all around the world. Find dozens of travel deals and cashback offers only with Rehlat. 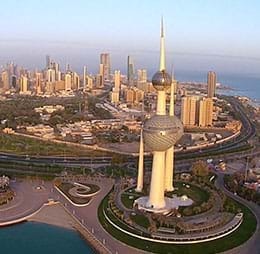 Kuwait includes a vast number of marvelous architectural and sightseeing places. Known for its Kuwait Towers, the city has other major attractions like Liberation Tower, the artifacts at the National Museum, the stunning beauty Failaka Island, and the cherry and joy time at the Entertainment City, Amusement and Recreational Parks. From ancient to religious attractions, Kuwait has a wide range of historical sightseeing’s include Souk Sharq, Seif Palace, Kuwait's Grand Mosque, Parliament of Kuwait, Jahra Gate, Shamiya Gate and Kuwait National Museum. There are plenty of other attractions in Kuwait, where you can learn much more interesting facts about the country. The city is equipped with some best shopping malls such as the Sultan Center, the Avenues, Lulu Hypermarket, Souq Sharq, ACE Hardware and Al-Fanar Complex. For a different shopping experience, take a cool stroll going to Marina World, Gold souks, Traditional Open Air, Friday Markets, Salhiya Complex, Souk Sharq, and Villa Moda in Kuwait, as these malls are excellent places for shopping. Kuwait is most popular for traditional Kuwaiti diet, which includes typically served grilled, Biryani, Balaleet, Bayt elgitta, Gabout, Gers ogaily, Ghuraiba, Harees, Jireesh, Khabees, Lugaimat and Machboos. Most of the people enjoy their evenings shopping in the souks and malls, dining, relaxing and chatting in restaurants and open-air coffee shops. Kuwait public transport is well connected with more than 400 buses every day to take the passengers safely, quickly and skillfully to their travel destination. It is easy way to hire a taxi in Kuwait, where you can find the call-taxis in white and orange color and few are in white and beige. Kuwait International Airport is the largest airport in the country, serves several million passengers annually. It is main hub for Jazeera Airways and Kuwait Airways. It is located in Farwaniya, just 15.5 km south of Kuwait City. Terminal 1: This Terminal provides world class amenities for domestic and international passengers. You can find several directions to roam around the airport by following the signs, there are over 100 automated check-in points, and a state-of-art baggage handling system, retail concessions, currency exchange and free Wi-Fi access. You can find several buses and taxis to Kuwait City (route 501) departing from outside Arrivals. It could take around a 30 minutes journey to reach the city. The taxi desk is situated at the Arrivals in the ground floor of the airport, taxi costs around 5KD to 6KD to travel to the heart of the city. Kuwait boasts of several budget hotels and has many state-of-the-art 5-star luxury hotels that offer an engaging environment and exceptional culinary experiences to their guests. Apart from a host of contemporary amenities like fitness centers, Wi-Fi, bed and breakfast benefits, most of the Kuwait city Hotels have world-class hospitality combined with scenic outside views to delight the guests. Begin your journey to Kuwait, a city that doesn't just boast of cultural highlights with vibrant city life but also is surrounded by remarkable countryside. The hospitality, the traditions, the food, and then there is, of course, a whole lot of shopping to get stuck into in Kuwait city. Whether you are going on a business trip, a luxury city break, a budget family holiday or adventure travel to Kuwait city, we have got the cheapest flights to get you there. Got a preferred airline or just want to stick to your budget, fret not, we would take care of all your specifications and bring the best selection of lowest fares around. Why is Rehlat the Best Place to Book Kuwait Flights? Not only the exceptionally simple booking gateway, but Rehlat has also got around 600+ airlines to choose from. With 1M+ destinations covered, be assured you would find your best bargain for Kuwait flights without comprising on your perfect travel date. With a customer delight team that speaks your language – English, Arabic, and Hindi, we are confirmed that you would love the complete experience that would follow you after you Kuwait flight booking with Rehlat.